Wow! This summer is really flying by. It's State Fair time in Iowa. Schools are gearing up. And we are finally going to get our vacation. We are headed to Medora, North Dakota. We have been there once before and enjoyed ourselves very much. This time we are going with friends which will make the trip even better. I have been busy stitching my next free BOM. It will begin in January, 2018. It will probably include 100 - 6" blocks. I have two different sets for this quilt. One uses 97 blocks, the other uses 100 blocks. I'm having a difficult time choosing the final look. Both sets would be lovely. Oh, by the way, I have 52 blocks stitched and 78 blocks designed. The final installment of Ann's Lyrical Christmas will be the candle/snow globe row shown above which will be published in October. Shirley Bauge took my class at Mended Hearts in Ellsworth, Iowa. Shirley didn't need a beginner's class. She does lovely applique. But she was uncomfortable with her outer points - a topic we covered in detail. 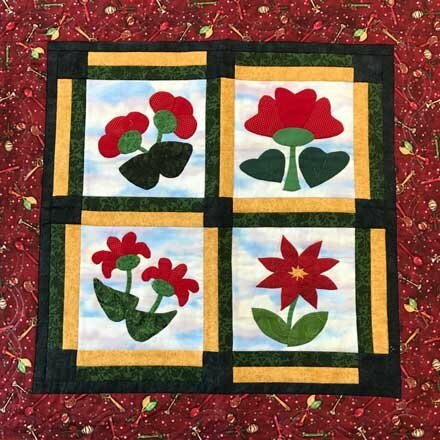 In this class I teach the four elements of hand applique - outer curves, inner curves, outer points and inner points. Each block in the quilt is designed to feature one of these elements. The first block the students stitch is a block which features outer curves - nothing but outer curves. Then one element is added as each additional block is stitched. The second block adds inner curves, the third block adds outer points and finally the fourth block features inner points. Thank you for sharing your quilt with us, Shirley. You have done a lovely job. Your outer points are perfect. 10/13/18 - Burlington Quilters' Guild, Burlington, MA Workshop We still have openings for thrfee weeks. I realize the last week of August is a very bad time. Folks are returning from vacations, kids are returning to school and it is just before Labor Day. While I really don't expect to fill this slot I sure would like to. However, I would really like to have a trunk show and workshop the weeks of 8/20/18 and 9/17/18. If you are interested, please contact me. Follow the instructions below to contact me. Click here to book your trunk show and workshop. Here's a re-cap of the rows that have been published so far. Now is your chance to catch up if you have missed a row. 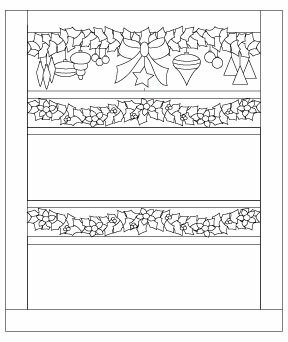 Click here to download "The Holly" row. Click here to download the "Baubles" row. Click on this link to download a PDF file of the "Lyrical" row of "Ann's Lyrical Christmas".